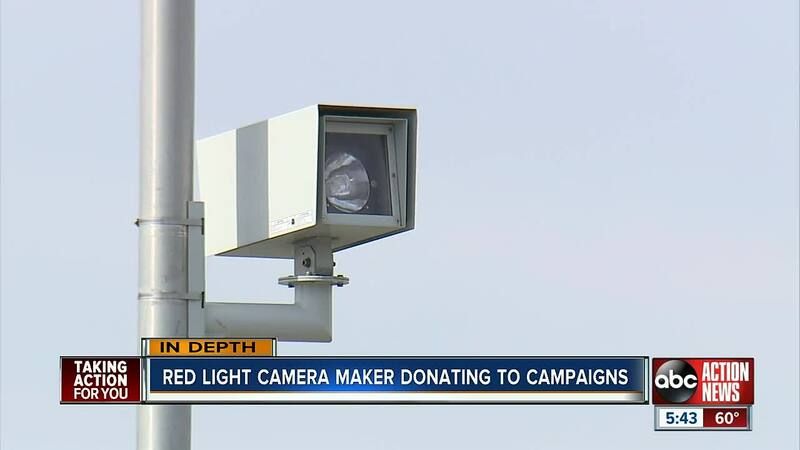 A bill to ban red light cameras in the state of Florida has ABC Action News following the money trail into the company behind the controversial technology. Banning the cameras is even a campaign promise for local mayoral candidate David Straz. ABC Action News found a money trail to not just politicians, but all political parties including both republicans and democrats. In the past ten years, American Traffic Solutions out of Scottsdale, Arizona has contributed more than $1 million dollars to Florida politicians and campaigns. Hillsborough County has seen some of those dollars from councilmen to commissioners — and a sheriff. Some of those names include mayoral candidate Harry Cohen. Cohen received $500 in 2015, and tells ABC Action News he forgot about the contribution. Adding that he doesn't have knowledge of receiving any money since, including the mayoral race. "This is as old as time," said political advisor Dr. Susan MacManus, "Some people call it advocacy, others calls it lobbying, others call it corruption, but there's a long way from just trying to lobby to corruption." Some of the other local names we saw include Commissioner Ken Hagan who received contributions three times according to finance records. As well as Sheriff Chad Chronister, who received a $1,000 contribution in 2018. ABC Action News reached out to both offices, but did not hear back.